Many companies, business owners and managers have a rough idea of their company culture and values, but don’t get anything documented and formalised. They don’t share this knowledge with employees, but they still expect staff to act accordingly! Jim Collins and Jerry Porras published their book “Built to Last: Successful Habits of Visionary Companies” in 1994, which covers their 6 year research project into what makes enduring companies great. They noted that core values are timeless, guiding principles that require no external justification, but give value to the company’s members. It is “The ultimate glue that bonds the best companies”. Good values will transform your business into one where people are climbing over one another to be able to work for you. Values are essential to help companies achieve their goals and their full potential. When you come to sit down to decide what your core values are, you also need to be able to define and give a brief definition of each, so that the people within your organisation truly understand what you are trying to achieve. The people you employ should also look at their own values to see how they fit with the company’s. You will also need to be able to measure if the company’s employees are working by the values, so you will need guidelines for example: We always strive to get the best from our staff – We hold annual appraisals and give each individual a personal development plan. If mistakes are made we learn from them and move on. Your cultures will be for ever changing and evolving. New employees will have their own ways of working and their own values and depending on how strong a culture you have, will determine how much of an influence that new employee has. Business growth, economic climate and the environment can all see changes to organisational culture. Your culture then needs to be working in sync with your strategic goals. Your formal policies will need to be improved. The core values can help decision making. They inform others about what is important to an organisation and what that organisation is about. Values that are clearly communicated to the public give a strong, competitive advantage to that company. Your company vision is backed up by your values and culture. So to sum up, take a look at how your organisation operates now. What is its current core values and culture? Then what is your vision for the company? How do you want it perceived by outsiders and employees alike? What needs changing within the culture of your business to get it to where you want it to be? After you have answered these questions then you can start to decide what the core values need to be and how you define each of these to make it easy to communicate to others. Review them regularly. Document them, have them on display, make sure all staff understand them and make sure you share them at every opportunity with customers and the public alike. If you need any help with defining you values, please get in touch. Today I’ll be looking at the role of company culture and values in business. A strong company culture is key to making companies long-lasting and great. So, what is company culture? Company culture is a ‘specific collection of values and norms that are shared by people and groups in an organisation’. These values ‘control the way they interact with each other and with stakeholders outside the organisation’. Authors Jim Collins and Jerry Porras shared the results of a six-year research programme in their book ‘Built to last: Successful Habits of Visionary Companies’. They described core values as the ‘ultimate glue that bonds the best companies’. The book ‘Transforming the Organisation’. explained that values are the guide to corporate life, defining its non-negotiable behaviours, and the guideposts that keep a company together and give it resilience. These experts placed responsibility on business leaders for ensuring their companies’ values are consistent and aligned. Efficient systems and processes underpin these values, and values will be key to recruiting and retaining the right employees. Company culture and values help with decision-making and reputation management. And they can give your business a strong competitive advantage. Core ideology is key to vision setting. They believe that successful companies have three to five core values, which are ‘fundamental’ and so ‘deeply held’ they rarely change, if ever. So, how do you go about identifying your company culture? Consider carefully what is important to you, your team, customers and other stakeholders. Ensure your company culture supports your strategic goals. Define your company culture clearly so all employees understand what it is and its importance, and also provide guidelines. For example: ‘We always strive to get the best from our staff. We hold annual appraisals and give each individual a personal development plan. If mistakes are made we learn from them and move on’. 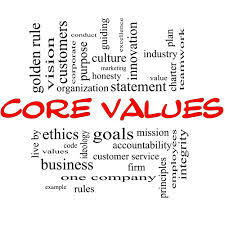 Document your core values, put them on display, ensure all staff members understand them and that they are clearly communicated to suppliers, customers and the general public. Of course, company culture will evolve, to reflect social, political, economic and environmental conditions. Isn’t it time you became the leader of a truly visionary company, with a strong company culture and values? Please get in touch if you would like help in defining your company culture and values. You can watch our video blogs on the Nozey Parkers You Tube channel to help your company grow. Our full range of business services and client testimonials are on our website.